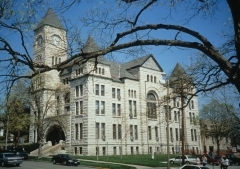 Built in 1896, the Atchison County Courthouse was designed by George P. Washburn and is an example of Romanesque-style architecture. This three-story building is built of gray ashlar stone, and a seven-story clock tower dominates the front facade. The courthouse is in the areas of local government and architecture. 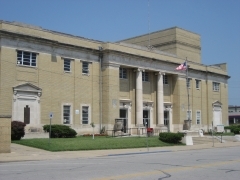 Built in 1922, the Atchison County Memorial Hall is a two-story buff brick Neoclassical-style building. A full-height porch supported by classical columns adorns the front facade as well as symmetrically balanced windows and entrance doors that reflect the architectural style. A variety of traveling theater companies performed in the facility during the 1920s and 1930s and celebrity appearances continued through the decades. Meeting spaces for both the white and black American Legion posts were also located in the building. The building, which is also known as the Soldiers & Sailors Memorial Hall, is significant in the areas of entertainment and architecture. 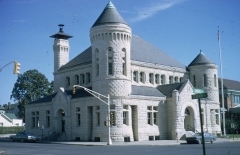 With the assistance of U. S. Senator John J. Ingalls, a native of Atchison, Congress authorized the construction of the Atchison Post Office in May 1890, and work began in 1892. 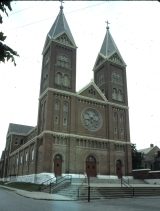 This Romanesque-style building is built of coursed ashlar limestone and features a prominent round corner tower with a conical top. The building is locally significant in the area of architecture. The Atchison Santa Fe Freight Depot, built in 1880, is a masonry building constructed with quarry-faced ashlar stone of contrasting corner quoins and fenestration surrounds. The building has two main sections - a two-story office on the west end and a one-story freight section on the east. The building was nominated as part of the "Historic Railroad Resources of Kansas" multiple property nomination and is locally significant for its architecture and transportation history. 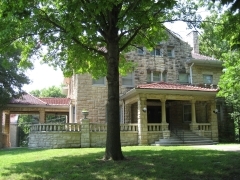 The Baker House is a large three-story stone residence that was designed by Kansas City-based architect Walter C. Root and completed in 1902. The house has an asymmetrical cube design and reflects a regional interpretation of the Mission style. There is a two-story carriage house that originally contained horse stalls on the ground floor with living quarters above and the home's heating equipment below in the basement. The property is locally significant in the area of architecture. 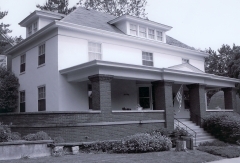 The Bolman House, constructed in 1912, is a two-and a-half-story residence clad in white stucco. It is simple in design and is representative of the Colonial Revival style with Craftsman details, including woodwork, leaded glass, and glazed tile. The Bolmans were an affluent family with roots in Atchison, beginning with Mrs. Bolman's father, Gaylord Wood Searles. The house is significant for its architecture. The Henry Braun house is a two-story Queen Anne-style cottage and built by the owner, Henry Braun. 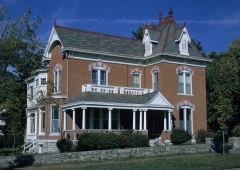 Braun built the house in 1884, remodeling and expanding the house in the early 1900s. The house has clapboard siding with chamfered bays on the south and east facades. Braun also designed and/or built approximately 100 Atchison homes. The house is significant as an example of a self-built home in the Queen Anne style constructed by one of Atchison's most prolific builders. Built in 1879 for John P. Brown, this two-story brick residence exhibits charatersitics of the Queen Anne style. Brown was a successful railroad contractor and businessman who obtained contracts for many of the early railroads in northeast Kansas. The house is significant for its architecture and its association with Brown and the early commerce of Atchison. The Burnes Rental Houses Historic District consists of three one-and-one-half story brick houses that feature a vernacular interpretation of the Gothic Revival style. 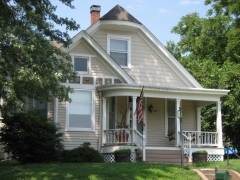 Built in 1879, the houses were developed as speculation or rental properties by the Burnes Brothers, who were fundamental in the founding and development of Atchison. The district is significant for its association with the development of Atchison and for their architecture.